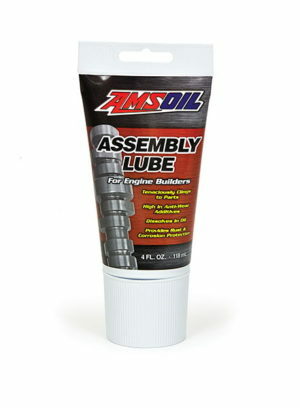 AMSOIL Engine Assembly Lube is formulated to cling to engine parts and provide exceptional wear protection, while inhibiting rust and corrosion in newly built or rebuilt four-stroke engines. It is designed to dissolve in oil, helping eliminate oil port clogging and deposit formation. Because building an engine can take from a few days to many months, using an engine assembly lube that clings well to parts for extended periods is critical. AMSOIL Engine Assembly Lube is formulated with a high-viscosity base oil and a unique tackifier for long-lasting, tenacious cling. AMSOIL Engine Assembly Lube is designed to dissolve in oil, helping oil ports remain clean, and helping to eliminate deposit formation under the valve covers and in the oil pan.